ECMP or ‘equal cost multi-pathing’ is a great routing feature that was introduced in NSX 6.1 several years ago. By utilizing multiple egress paths, ECMP allows for better use of network bandwidth for northbound destinations in an NSX environment. As many as eight separate ESG appliances can be used with ECMP – ideally on dedicated ESX hosts in an ‘edge cluster’. The diagram above is very high-level and doesn’t depict the underlying physical infrastructure or ESXi hosts, but should be enough for our purposes. BGP is used exclusively as the dynamic routing protocol in this environment. Looking at the diagram, we can see that any VMs on the 172.17.1.0/24 network should have a DLR LIF as their default gateway. Because ECMP is being used, the DLR instance should in theory have an equal cost route to all northbound destinations via 172.17.0.10 and 172.17.0.11. As seen above, all of the BGP learned routes from northbound locations – 172.19.7.0/24 included – have both ESGs listed with a cost of 200. In theory, the DLR could use either of these two paths for northbound routing. But which path will actually be used? In order for ECMP to load balance across multiple L3 paths effectively, some type of a load balancing algorithm is required. Many physical L3 switches and routers use configurable load balancing algorithms including more complex ones based on a 5-tuple hash taking even source/destination TCP ports into consideration. The more potential criteria for for analysis by the algorithm, the more likely traffic will be well balanced. NSX’s implementation of ECMP does not include a configurable algorithm, but rather keeps things simple by using a hash based on the source and destination IP address. This is very similar to the hashing used by static etherchannel bonds – IP hash as it’s called in vSphere – and is generally not very resource intensive to calculate. With a large number of source/destination IP address combinations, a good balance of traffic across all paths should be attainable. A few years ago, I wrote an article for the VMware Support Insider blog on manually calculating the hash value and determining the uplink when using IP hash load balancing. The general concept used by NSX for ECMP calculations is pretty much the same. Rather than calculating an index value associated with an uplink in a NIC team, we calculate an index value associated with an entry in the routing table. This destination uses esg-a2. If you repeat the traceroute, you’ll notice that as long as the source and destination IP address remains the same, the L3 path up to the ESGs also remains the same. Traceroute is well and good, but what if you don’t have access to SSH/RDP into the guest? Or if you wanted to test several hypothetical IP combinations? Thankfully, NSX includes a special net-vdr option to calculate the expected path. Let’s run it through its paces. Keep in mind that because the ESXi hosts are actually doing the datapath routing, it’s there that we’ll need to do this – not on the DLR control VM appliance. Since my source VM win-a1 is on host esx-a1, I’ll SSH there. It should also be noted that it really doesn’t matter which ESXi host you use to check the path. Because the DLR instance is the same across all configured ESXi hosts, the path selection is also the same. In my case, I’ve got only one instance called default+edge-1. The ‘Vdr Name’ will include the tenant name, followed by a ‘+’ and then the edge-ID which is visible in the NSX UI. Next, let’s take a look at the DLR routing table from the ESXi host’s perspective. Earlier we looked at this from the DLR control VM, but ultimately this data needs to make it to the ESXi host for routing to function. These BGP learned routes originated on the control VM, were sent to the NSX control cluster and then synchronized with ESXi via the netcpa agent. The routing table looks similar to the control VM, with a few exceptions. From this view, we don’t know where the routes originated – only if they are connected interfaces or a gateway. Just as we saw on the control VM, the ESXi host also knows that each gateway route has two equal cost paths. As seen above, the output of the command identifies the specific route in the routing table that will be used for that source/destination IP address pair. As we confirmed in the traceroute earlier, esg-a1 (172.17.0.10) is used. NSX’s implementation of ECMP is applicable to egress traffic only. The path selection done northbound of the ESGs would be at the mercy of the physical router or L3 switch performing the calculation. That said, you’d definitely want ingress traffic to also be balanced for efficient utilization of ESGs in both directions. Without an appropriate equal cost path configuration on the physical networking gear, you may find that all return traffic or ingress traffic uses only one of the available L3 paths. In my case, I’m using a VyOS routing appliance just northbound of the edges called router-core. I’m honestly not sure what load balancing algorithm VyOS implements, but from an NSX perspective, it doesn’t really matter. It doesn’t have to match, it simply needs to balance traffic across each of the available L3 paths. As long as an ingress packet arrives at one of the ESGs, it’ll know how to route it southbound. So there you have it. There is obviously a lot more to ECMP than what I discussed in this post, but hopefully this helps to clarify a bit about path selection. Although in most cases, it’s not necessary to obtain the NSX VIBs, there are some situations where you’ll need them. Most notably is when incorporating the VIBs into an image profile used for stateless auto-deploy ESXi hosts. Legacy vib location. Used by code to discover avaialble legacy vibs. The file itself is about 17MB in size in 6.3.2. Despite being named vxlan.zip, it actually contains two VIBs – both the VSIP module for DFW and message bus purposes as well as the VXLAN module for logical switching and routing. It’s always an exciting time at VMware when a new NSX build goes ‘GA’. 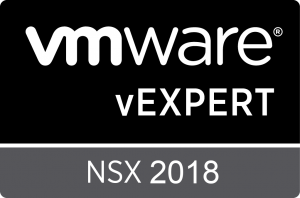 Yesterday (July 6th) marks the official release of NSX-V 6.2.8. NSX 6.2.8 is a maintenance or patch release focused mainly on bug fixes, and there are quite a few in this one. You can head over to the release notes for the full list, but I’ll provide a few highlights below. This was a fairly common issue that we would see in larger deployments with large numbers of dynamic security groups. The most common workflow that would trigger this would be putting a host into maintenance mode, triggering a large number of simultaneous vMotions. I’m happy to see that this one was finally fixed. Unfortunately, it doesn’t seem that this has yet been corrected in any of the 6.3.x releases, but I’m sure it will come. You can find more information in VMware KB 2150668. This next one is not quite so common, but I’ve personally seen a couple of customers hit this. If you have a VM in a VLAN network, and then move it to the VXLAN dvPortgroup associated with the bridge, connectivity is lost. This happens because a RARP doesn’t get sent to update the physical switch’s MAC table (VMware often uses RARP instead of GARP for this purpose). Most customers would use the VLAN backed half of the bridged network for physical devices, and not for VMs, but there is no reason why this shouldn’t work. I think this one is pretty self explanatory – if the manager can’t process API calls, a lot of the manager’s functionality is lost. There are a number of reasons an ESXi host could lose its communication channel to the NSX manager, so definitely a good fix. Another good fix that should help to reduce NSX manager CPU utilization and improve scale. Multiple IPs on vNICs is fairly common to see. I’ve seen this issue a few times in very large micro segmentation environments, and very happy to see it fixed. This should certainly help improve stability and environment scale. Author MikePosted on July 7, 2017 September 8, 2017 Categories Install and Upgrade, NSXTags NSXLeave a comment on NSX 6.2.8 Released! NSX isn’t just a few virtual machines that can be deleted – there are hooks into numerous vCenter objects and it must be removed properly. Admittedly, removing NSX from an environment was not my first choice of topics to cover, but I have found that the process is often misunderstood and done improperly. NSX isn’t just a few virtual machine appliances that can be deleted – there are hooks into numerous vCenter objects, your ESXi hosts and vCenter Server itself. To save yourself from some grief and a lot of manual cleanup, the removal must be done properly. Thankfully, VMware does provide some high level instructions to follow in the public documentation. You’ll find these public docs for NSX 6.2.x and 6.3.x respectively here and here. There are many reasons that someone may wish to remove NSX from a vSphere environment – maybe you’ve installed an evaluation copy to run a proof of concept or just want to start fresh again in your lab environment. In my case I need to completely remove NSX 6.2.5 and install an older version of NSX for some version-specific testing in my home lab. Remove all VMs from Logical Switches. Remove NSX Edges and Distributed Logical Routers. Uninstall NSX from all ESXi hosts in prepared clusters. Delete the NSX Manager and NSX Controller appliances. Remove the NSX Manager hooks into vCenter, including the plugin/extension. Cleaning up the vSphere Web Client leftovers on the vCenter Server.